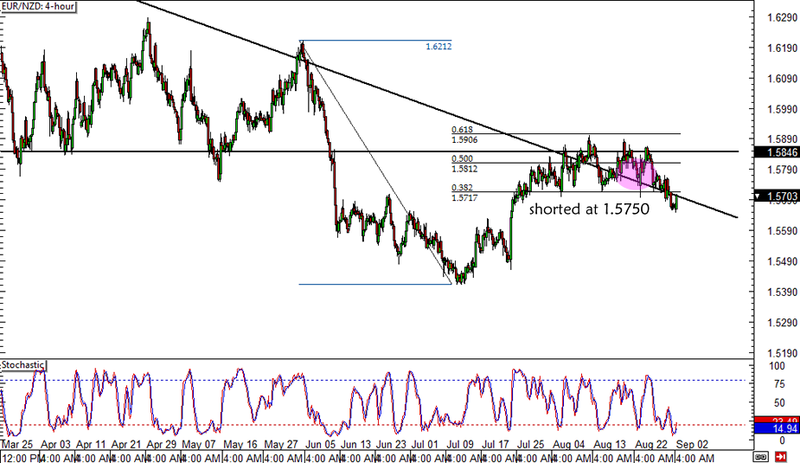 Looks like my patience is finally paying off on this EUR/NZD short forex trade! After WEEKS of consolidation and a few close calls, price finally showed downside momentum after it broke below the short-term support around 1.5730. A few days back, I had been feeling frustrated that I chose to short this pair instead of EUR/CAD or EUR/AUD – both of which had sharper declines recently. It appeared that the euro and the Kiwi were similarly weak, as the ECB appeared ready to ease further while the New Zealand economy printed bleak data. However, I decided to hold on mostly because of the positive carry and my bias that the Kiwi is still fundamentally stronger than the euro. Now that the pair looks ready to head further south, I’m considering adjusting my stop a little lower prior to the ECB rate decision this week. I’m also thinking of adding on a pullback to the 1.5730 broken support zone or on a strong break below the 1.5700 mark. I still plan on aiming for the previous lows near 1.5400 first but I’m open to aiming for new lows, depending on how the ECB statement turns out.